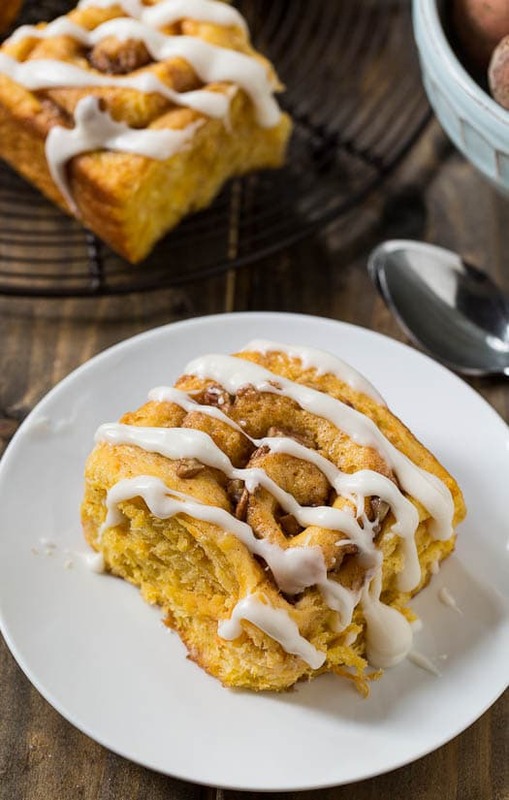 Moist and tender Sweet Potato Cinnamon Rolls with a cinnamon-pecan filling and a sweet sugar glaze will really hit the spot for a lazy weekend breakfast. Mashed sweet potatoes give the rolls a beautiful orange hue and also add to the flavor. I’m crazy about using sweet potatoes in anything and everything, especially this time of year. Recently I made Sweet Potato Rolls and had plenty of dough left over to do something else with. Cinnamon rolls immediately came to mind. I hadn’t made them since making Strawberry Sweet Rolls. I rolled the dough out and spread it with a combination of brown sugar, butter, cinnamon, and chopped pecans. Next I rolled the dough up and cut it into slices. After letting the rolls rise until doubled in bulk, I baked them for just 20 minutes and drizzled them with a simple powdered sugar glaze for a little more sweetness. And boy of boy, what a delicious breakfast. Yes cinnamon rolls are a little time consuming to make, but if you enjoy baking, it is time well spent. 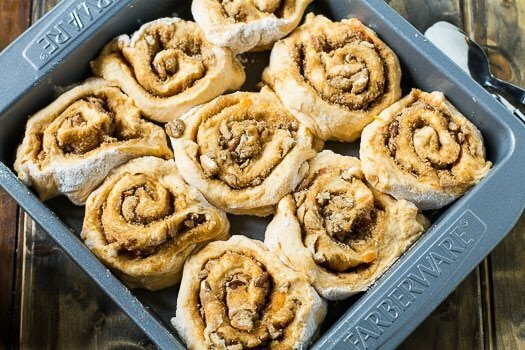 Tender sweet potato cinnamon rolls with a brown sugar-pecan filling and powdered sugar glaze. Prepare sweet potato dough and let rise in refrigerator overnight. Lightly flour a work surface and roll dough into a 12x9-inch rectangle. In a small bowl, combine brown sugar, flour, cinnamon, butter, and pecans. Sprinkle mixture evenly on dough. Starting at wide end, roll dough up. Use a knife or dental floss to cut into 9 rolls. Place rolls in a lightly greased 9-inch square baking pan. Let rise until doubled, about 1 hour. Bake in a 375 degree oven for 20-25 minutes. Whisk together all ingredients for glaze in a bowl. Drizzle glaze on cinnamon rolls. This entry was posted in General and tagged Cinnamon Rolls, sweet potatoes. Bookmark the permalink. Just made these last night. Yum. Next time, however, I would spread the butter onto the dough first and then sprinkle the sugar mixture on top of that. The instructions basically made a paste with the sugar and butter. It was difficult to get evenly distributed onto the dough. These were wonderful, instead if using butter in the center of these, I reserved some of my sweet potato mash and used that. Delicious! I don’t know why I haven’t made sweet potato rolls before. They always look so good and with the cinnamon and glaze they sound even more amazing! I love cinnamon rolls, and love sweet potato or potato rolls. They look so good, moist and sweet. Love them. 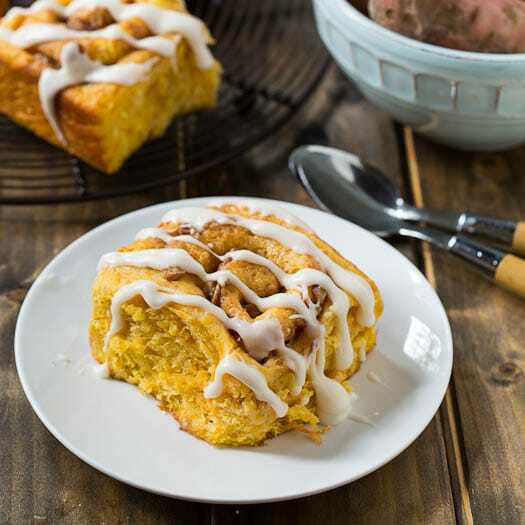 Never tried a sweet potato cinnamon roll before! Loving the colour of them especially and all that glaze going on.. wish I had one to devour right now. Another great recipe Christin! 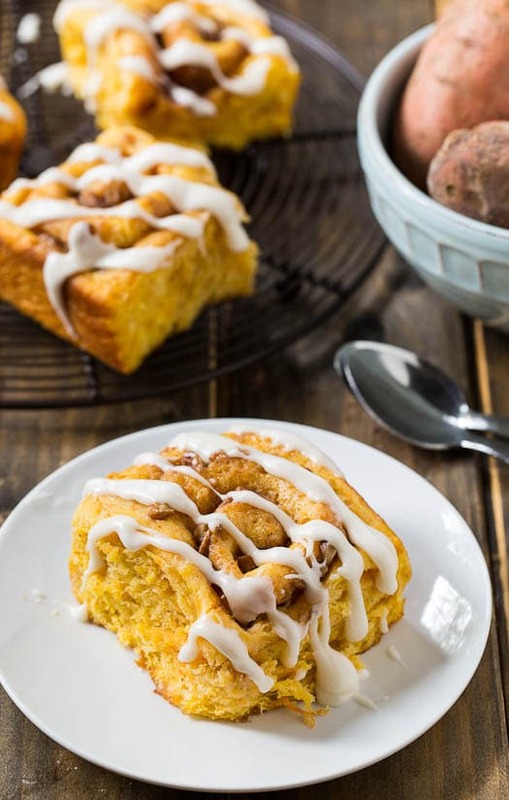 You’ve done it now — sweet potatoes in cinnamon rolls has to be the greatest idea! 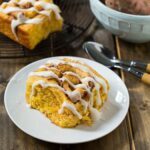 This is a must try, and might make me get in the kitchen and make some cinnamon rolls very soon! Time spent making cinnamon rolls is always time well spent! I need to experiment more with sweet potato in dough. These cinnamon rolls look wonderful! I am loving all the brilliant recipes you come up with incorporating sweet potatoes – I am wondering – do the sweet potatoes make the dough moister? Thanks Shashi! Yes, they do make the dough moister. I feel like I say this on all of your recipes, but these rolls are gorgeous! 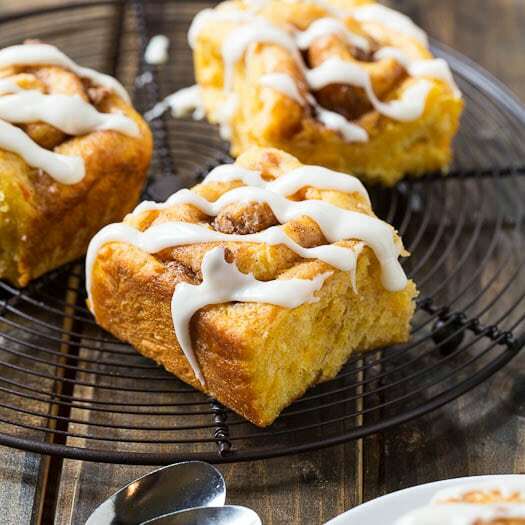 What a great idea to make cinnamon rolls! Pinned! 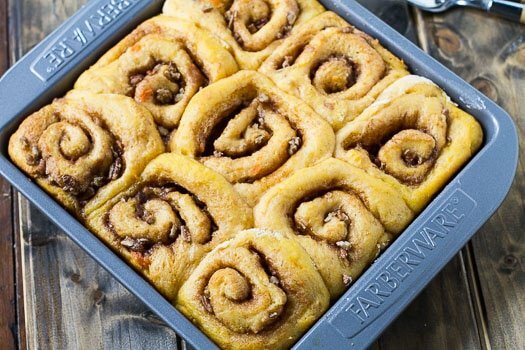 How delicious do these cinnamon rolls look? I mean wowza I want one right out of the oven! They look super yummy! And the color is just beautiful! What a great way to use of the rest of the sweet potato dough! 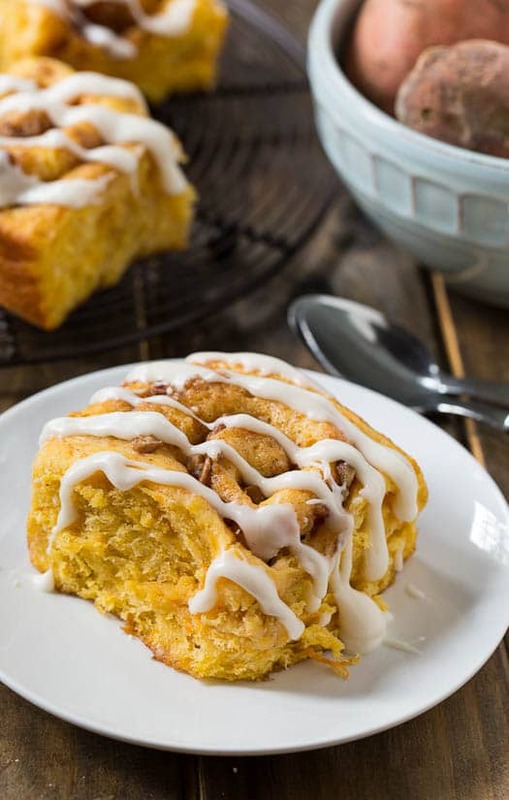 These cinnamon rolls look so soft and the filling pair so well with sweet potatoes too!